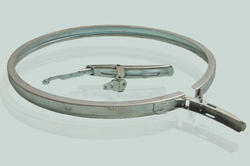 We manufacture wide range of Size of Metal/Fibre drum locking rings with the clamps. Our rings and clamps are been used in major oil/chemical packing industry in India as well as exported in Various European countries. We are involved in the manufacturing and supplying of a supreme quality Plastic Drum Ring. Owing to its breakage resistance and durability, this product has fetched high demands in the market. Known for its fine finish and dimensional accuracy, the entire range of the 10 inch diameter plastic rings offered by us is widely praised among the client-base we have accomplished to gain so far. We are manufacture of Plastic drum locking ring. - 60mm to 2000mm, in metal from 0.5mm to 2.5mm thick. We are one of the well-established organizations that are engaged in offering a wide array Drum Rings to our valued clients. The offered drums rings are manufactured using best quality raw material and under the assistance of highly skilled industry professionals. 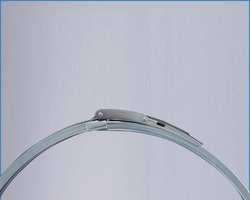 Banking on our enriched industry experience, we are able to supply Plastic Drum Locking Ring. We offer superior quality drums closure clamps, which are widely used for packaging purposes. these packing drums closure clamps can be availed in various sizes and shapes as per client's requirements.